Artist Nolan Oswald Dennis’ show opened at the Goodman Gallery, Cape Town on April 14. Born in 1988 in Zambia, Dennis is part of that exciting new generation of South African artists born as apartheid was looking into its own abyss, contemplating its own mortality, which made the beast more vicious and more unpredictable. His work has gained prominence in the last few years, when a new South Africa (another one!) is emerging. Little wonder then that his work shows a keen awareness with space, time and memory — in other words, history. My work is research-based and project-orientated. 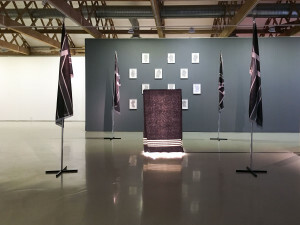 I tend towards drawing and installation, and my work has up till now had an interest in time and space as they are filtered through some social constructs – like memory, forgetting, archive, monumentalising, I tend to start with a vague idea which floats around my head for some time, usually unconnected to any artist impulse, just a query or a preoccupation. These inquiries slowly, very slowly, start to suggest forms that open up possibilities of further inquiry. This is something I’m understanding about my practice more and more, that if I produce work it is not in the pursuit of answering or even asking a question, but rather a way of opening up a field of engagement. I feel that producing art is always a means towards deeper critical engagement, never an end in itself. Your work shows a strong research ethos. Do you want to talk a bit about this? I think the research precedes the idea of work, I research things without any intention of producing art work, only once in a while does anything I’m dealing with actually convert into an art practice. I do research for my own need, to understand what is going on around me. You have training in architecture and the built environment. How does this affect your practice? I really think around two ideas, representation and spatialisation. My drawing practice is very much influenced by architectural drafting conventions, and my need to stretch the limits of what it does and what kind of information it can hold. There is this idea that psychoanalysis is a spatial practice, and I guess that’s true because life is a spatial condition. I try to be fully conscious of space when I work, when I sow work. I am interested in an expanded sense of the built environment – like the environment which we have build for ourselves, which is physical, political, spiritual, memorial and speculative. It’s like all these things are always spatially present and exerting an influence on our experiences, so I try to work consciously of how I can or am affecting the human environment around me. Do you want to talk about your current exhibition? The show is about trying to pull apart the boundaries of time that make things seem like they are either over, or starting again. I am interested in the idea that some things never end. The show is called Furthermore, and I think of it as trying to add some ideas of continuity, [of] furthering the everyday ideas of how and what we are. I mean ‘what we are’ in this specific moment – the so-called return of radicalised politics, the emergence of student consciousness, the woke agenda. You have said, before, “that I am interested in aspects of social fiction: mapping the contours of our highly coded human environment, reading the signs/ciphers/markers of blackness in thisness, the mechanics of imaginary topologies and the collapse of social certainty.” Do you want to expand on this? There are things in the old that are completely transparent, but function through misrecognition. We are meant to see them but not decode their meaning. I am very interested in trying to find the extra meaning embedded in every thing. These extra meanings have particular meaning to the reality of being black in this world. We are suffering from the overrepresentation of colonial infrastructure, nearly everything is mobilised [to] maintain the grand project of white-supremacy, patriarchy and western cultural-economic imperialism. It’s like, even when the Chinese come to Africa, they come in the costume of the western; or when Africans go to India we go as Afropolitans. There is a degree of stuff that’s taken for granted, we’re folded in on ourselves to the point where our very existence demands a decolonisation, but our entire environment reproduces the colony. You collaborate quite a lot, with architects and with other visual artists. Why is collaboration important for your practice? I always aim for collaboration, I am getting to this point of thinking everything is a social product, so even in the work I produce in private I am gathering the work of so many people who came before me – in some direct ways, like references and influences, but also in the sense that this project of trying to make sense of your surrounding is an ancient one and is passed down through our DNA. But this is not enough, I do try every hard to engage with other practitioners who I respect, I know that working together is the hardest thing to do in a world that worships individuals, but I think any serious practice must be in conversation with its community. Even though my personality is more isolationist, I feel like I’m lost if I’m too alone, I orientate myself through working with other people.